When my cousin and his wife from Colorado visited the Quad Cities a few weeks ago one of the first things that they wanted to experience was seeing the Mississippi River. I had given them a packet of brochures from the Quad Cities Convention and Visitors Bureau Welcome Center in Moline and they found a riverboat cruise on the Celebration Belle to be most inviting to them. We were happy to find that the Celebration Belle was doing a scenic cruise on July 4th at 2:00 p.m. so we took advantage of the perfect day! Being a local I was happy to see the number of tourists who were on the cruise. Everyone was excited to be able to take a leisurely and informative tour of the area on the historic river. The Channel Cat Water Taxi is a perfect adventure for any summer day. It really is fun for all ages, but it seems that kids particularly enjoy the magic of riding on the river. If you are going to take your kids, here are a few things we have learned on our visits. Creamy deliciousness coated in chocolate? I think Whitey’s Ice Cream has some major local competition…maybe more like a sibling rivalry. Get ready for the race of the summer! Jazz, July and…running? That’s right. Lace up your running shoes and grab your iPods. 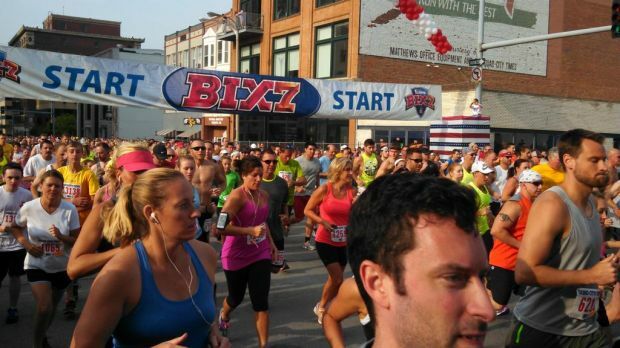 It’s time to get ready for the annual Quad-City Times Bix 7! The Quad Cities is hosting a lot of sports events this summer and fall from archery to BMX, from pool to softball to weightlifting. Check out our fun video the Quad Cities CVB Staff made. The Quad Cities hosts its first large-scale archery tournament on July 17-19, 2015. The Regions Archery ProAm Tour Tournament features a Bowlife hunter simulation challenge that the public is welcome to try. The competition for 300 takes place on Credit Island, 2200 W. River Drive in Davenport. It is free for spectators. The team shoot is 1 p.m. on Friday; ProAm at 12 noon on Saturday; and 8 a.m. on Sunday. The Quad Cities’ first all homebrew festival is Saturday, July 18th from 2-6pm down in The District in downtown Rock Island. River’s Edge Homebrew Festiv-Ale will feature over 50 different beers brewed by 10-12 home brew clubs from around the Midwest. The brewers will be pouring their own beers, so attendees will be able to meet the ladies and gentlemen behind the craft and chat with them about their concoctions. As the mom of a toddler boy, the John Deere Pavilion has been a local favorite for a while. There are TRACTORS. And a PLAY AREA. And it’s FREE. But we recently had the chance to visit again and check out the Discovery Zone Exhibit. Shop For Handcrafted Pottery In A Colorful Bungalow! When I think of shops unique to the Quad Cities, one that is top on my list is Dot’s Pots. Dot’s Pots is a pottery shop in a bungalow in Moline, Illinois. At first you will be attracted to the bright colors of the front entrance to the shop and the smiling moose sign out in front. Once inside you will find both functional and non functional pottery in all shapes and sizes, from miniatures for fairy gardens to multi-tiered bird baths to bowls and platters and humorous animal sculptures. Deep in the heart of Rock Island, every Monday night, something very special is happening. People of all ages venture out around 7:30pm and head to Rozz Tox, a hip little coffee shop that is so much more than just a place to have tea. In the back there is a performance hall where live music is enjoyed during the evening hours. One would suspect that a Friday or a Saturday night would be the busiest of times here, but Moeller Mondays have changed that.